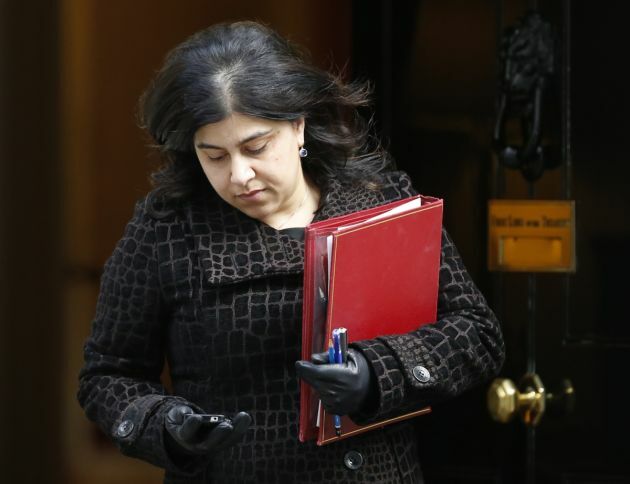 Britain's Minister of State at the Foreign Office, Sayeeda Warsi, leaves after a Cabinet meeting at 10 Downing Street in London March 4, 2014. The United Kingdom's first female Muslim Cabinet member has resigned in protest at Prime Minister David Cameron's policy over the Gaza conflict. Sayeeda Warsi a senior minister in Britain's foreign office announced her resignation Tuesday on Twitter saying, "With deep regret I have this morning written to the Prime Minister & tendered my resignation. I can no longer support Govt policy on #Gaza." In her resignation letter, she said that Britain's "approach and language" on the crisis in Gaza is "morally indefensible," and will have a dangerous impact on the country's international and domestic reputation. Warsi stressed that Britain's approach to the conflict is "neither consistent with our values, specifically our commitment to the rule of law and our long history of support for International Justice." The Prime Minister said he was "sorry" about Warsi's decision as she had not discussed her plans to quit with him. In a public letter Cameron said, "I realise that this must not have been an easy decision for you to make and very much regret that we were not able to speak about your decision beforehand." Cameron also defended Britain's policy on Gaza, saying "I understand your strength of feeling on the current crisis in the Middle East – the situation in Gaza is intolerable. "Our policy has always been consistently clear: we support a negotiated two state solution as the only way to resolve this conflict once and for all and to allow Israelis and Palestinians to live safely in peace." Foreign Secretary Philip Hammond was surprised by the timing of Lady Warsi's resignation. He said that they had spoken "a great deal" over the weekend and progress is now seen amidst the conflict, The Telegraph reported. "I do find it rather surprising that she has chosen now, this particular moment, to take this step when, in fact, we are now at long last seeing some relief, seeing some progress on the issues about which she was so passionately concerned," Hammond said. Deputy Prime Minister Nick Clegg a member of Cameron's coalition from the Liberal Democrats said that it is an "open secret" that opinions of ministers vary "in reaction to the bloodshed in Gaza." Despite being a Zionist, he himself considers the Israeli action in Gaza as "ugly disproportionate and tragic" and will harm Israel in the long run.